America was shocked. A major Hollywood film maker had its proprietary information hacked—personal emails, scripts, unreleased footage—and spilled out onto the web. The criminals wanted to establish they were serious. 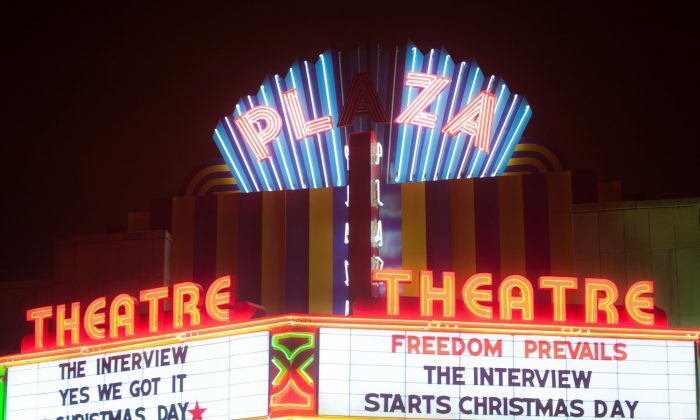 If Sony did not withhold the movie The Interview from release, terror attacks targeting movie theaters would follow. Commentators agreed: this was a new kind of threat. A totalitarian regime was trying to determine what Americans could watch. Our way of life was at stake in a manner never before seen. Since the initial reports, the story has become more complicated. Experts have determined that the release of Sony’s information was accomplished by an insider at the company, not by a North Korean hacker. The latest news is the insider was probably working for Russia or China. After initially withdrawing the film, Sony released it successfully in independent theaters, as Americans flocked to see what all of the fuss was about. While the plot has become tangled, the first impressions of the Sony affair were very valuable. Totalitarian regimes are threatened by freedom of expression here in the United States. Totalitarian regimes are threatened by freedom of expression here in the United States. They do dream of forcing American society to operate inside the straitjacket they force on opinion in their home countries. These home truths were misleading, though, in one important way. What North Korea was accused of doing was nothing new. Of course, we haven’t had nations threatening to blow up movie theaters before. But we have had a nation seeking to limit what Americans can see, hear, and know. The People’s Republic of China has been doing this for decades. There are two forms of conflict in this world, by dominating through force or through opinion. The Cold War featured a great clash of ideologies, but in the end it was a confrontation of brute force. The Soviet Union and its allies competed with the free world with armaments and nuclear warheads. The Soviet Union acknowledged its ideology was bankrupt only when it realized it could no longer compete with American armaments. It was President Reagan’s star wars that defeated the Soviet Union, not Voice of America. Inside the United States, while the Soviet Union had front organizations, it did did little, if anything, to infiltrate into America’s daily life. When the Cold War finally ended, the influence and impact of the Cold War disappeared from American life just as fast as the collapse of the Soviet Union. It is not always as easy to see a war of opinions at work as it is to see a war based on force. The Chinese Communist regime is highly skilled at manipulating opinion, working constantly to recruit individuals and organizations here inside the United States that can speak for the regime, without having any known association with the regime—what is called united front work. The Chinese regime also immediately attacks individuals or organizations that might move opinions in a way it finds threatening. For instance, in 2008 the New York-based Shen Yun Performing Arts started to present traditional Chinese culture to the world through dance and music. Almost at the same time, the Chinese regime started to interfere with Shen Yun’s performances. The Chinese regime fears the attractiveness of China’s traditional culture, which the regime has sought to replace with its own, manufactured culture. Were people around the world, and people in China, to awaken to the beauty of China’s original culture, the communist regime in China would be seen instantly as illegitimate. One of the methods the regime has used is to write letters to the theaters where Shen Yun is booked, demanding the theater cancel the performances. When Shen Yun performed at the New Jersey Performing Arts Center (NJPAC) in January 2009, the director of NJPAC received daily harassing phone calls from the Chinese Consulate in New York, urging her not to host Shen Yun. We know about these two cases and others like them in the United States and in other countries because those who were threatened spoke out. There are many other cases where theater management told the producers of the Shen Yun performance about threatening phone calls and letters, but preferred not to go public with the information. We can’t be sure how many in total have received such threats, although given the way the Chinese regime works, it would be surprising if any Shen Yun venue was left out of the regime’s campaign. We also don’t know how many times venues rejected a Shen Yun booking because of pressure from the regime. Shen Yun Performing Arts is a U.S. company, the theaters are U.S. businesses, the audiences are U.S. residents. What makes the Chinese communist regime believe that it has the right to decide what Americans can see and what American businesses can do? The Chinese regime also puts pressure on local governments in the United States. Falun Gong is the hottest hot button issue for the Chinese regime. The regime originally feared how attractive the practice was—how many people from all walks of life took it up and how Falun Gong’s traditional morality responded to the people’s needs more effectively than the Communist Party’s ideology. Now the regime fears the Chinese people and people around the world will learn of the crimes against humanity the regime has committed in attempting to eradicate this practice. Here in the United States, local governments have issued proclamations about Falun Gong. Sometimes these recognize the salutary effects of the practice. Sometimes they condemn the persecution of it, or both. The Chinese regime treats these proclamations as fires that need to be put out. In 1999 alone, at least four proclamations issued to Falun Gong practitioners, in Seattle, Baltimore, Maryland and San Francisco, were withdrawn due to pressure from Chinese Consular officials. Seattle Mayor Paul Schell even wrote a letter of apology to the then Chinese ambassador. These proclamations are exclusively the business of local governments. There is no reason to listen to a foreign totalitarian regime, much less issue an apology to it. Why do U.S. mayors need the Chinese embassy to tell them how to run our cities? U.S. education is also targeted in the Chinese regime’s war to mold opinion here. When a U.S. university opens the door to a Confucius Institute, it practically accepts as a condition of operation not teaching about “sensitive issues” as defined by the Chinese regime. The American standard, which recognizes the importance of individual rights and freedom of expression, is set aside. The Confucius Institutes listen to an office in Beijing and implement its policy. The University that accepts the Confucius Institute stands alone in facing the regime of China and the pressure that regime can bring to bear. Just as the universities negotiate alone with the Chinese regime, so the local governments that issue proclamations to Falun Gong and the theaters that host Shen Yun each face pressure from the Chinese regime alone. Those who reject the regime’s arrogant demands are praiseworthy. Yet, it’s understandable that some couldn’t. In contrast to how the U.S. institutions each stand alone, the representatives of the Chinese regime operate as a single force. Whether the regime is represented by consular officials, a private Chinese company, a local government delegation, or a U.S. based-Chinese community organization, all work from the same play book, speaking like puppets on behalf of their masters in Beijing. The U.S. entities, even if they want to fight back, are alone. It’s not a fair fight. They can be pressured one by one, often from multiple angles. With the end of the Cold War, the challenge that America faces is totally different than an arms race. The attack on Sony had this one great advantage. It awakened our country to how totalitarian regimes take our thoughts just as seriously as our weapons. A hostile campaign to shape American thoughts is well developed. The countermeasures in this war of opinions lie within ourselves. In staying true to American principles and defending free expression and human rights, the United States will triumph. The only weapons we need fear in this war of opinion are ones we surrender to our foes.